Door Construction – Doors are constructed from a series of aluminum rods and spacers providing 9″ x 2″ patter (Optional 9″ x 1-1/2″). Grille doors allow maximum airflow and visibility while maintaining security protection. Track System – Track System – Heavy duty aluminum side track with HDPE wear strips added for additional wear protection and to minimize track noise. Paylon Roll up Security Doors offer an economical solution for allowing maximum airflow ventilation and visibility while preventing un-authorized access to restricted areas. Curtains for the roll down grille can be powder coated, mail slot, straight grille or brick grille pattern (Chain mesh – Special Application). All our Commercial Security Doors come as a complete kit, custom made for your application. The doors are easy to install and are designed to give many years trouble free operation. The industrial roll up security door can be either header or face of wall mounted and come with all the necessary parts for a complete installation. 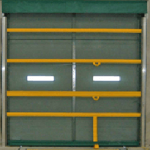 Roll-up security doors are constructed with high-grade materials with few moving parts. This will ensure easy installation and provide many years of trouble free service. All main components are easy to replace. Depending on your application we offer 2 types of electric grille doors (Standard duty or high cycle).